Submitted by Raphael Pulgar on Mar. 7, 2019. First published on Nov. 10, 2017 written by Mason Hoberg and last updated on Mar. 7, 2019 by Raphael Pulgar. If you're serious about improving or maintaining your drumming skills, practice shouldn't end the moment you step away from your drum kit. Training with drum practice pads keeps your skills sharp while helping you notice small things to improve because you're no longer bombarded with high decibel sounds. On the other hand, using the wrong type of surface will make you develop bad habits that won't translate well when you return to your kit. The best drum practice pads enable you to train your muscle memory and rhythmic sense without losing power or control when you do start to perform on an actual kit. Presented below is our updated selection of the best drum practice pads for 2019. Playing smaller pads forces you to play more accurately and hit your strokes dead center. 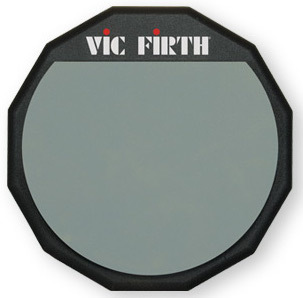 The Vic Firth Single Sided 6" Drum Practice Pad is an affordable small practice pad that lets you work on your control. The soft rubber playing surface offers less rebound than other materials. This encourages drawing out more power in your stroke which can be a challenge given the small size of the pad. Many users note that the feel is very good given the softer nature of gum rubber. Some specifically note the sound to be similar to a rim shot. The rubber base also gets some appreciation as it prevents the pad from moving around when placed on a surface such as a table. A user mentioned that after a few uses, the gum rubber began to get dirty. Another noted that the rubber started coming off and had to be re-glued, but this particular comment seems to be an isolated case. 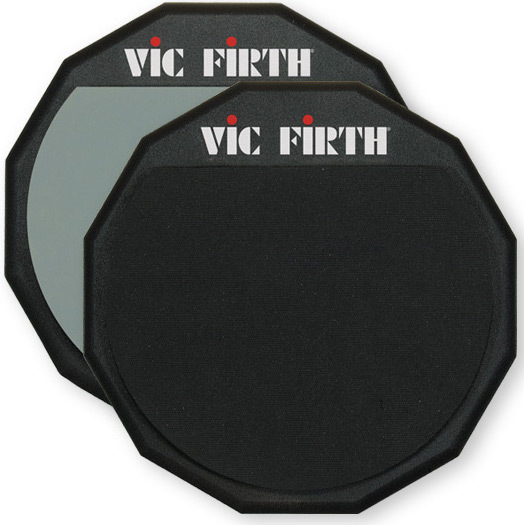 Offering a great middle ground between high and low levels of rebound in a small pad for precision training, the Vic Firth Single Sided 6" Drum Practice Pad is a great budget option for those looking to improve both their accuracy and stroke. 96 out of 100. Incorporating 750+ ratings and reviews. While many think the The Evans RF-12D RealFeel 12" Speed and Workout Drum Pad is a recently designed product, the original design for the RealFeel drum pad has been around since the late 80s and early 90s and was distributed by a company called HQ Percussion. HQ was acquired by D'addario in 2004 and their products were eventually assimilated into the Evans brand. 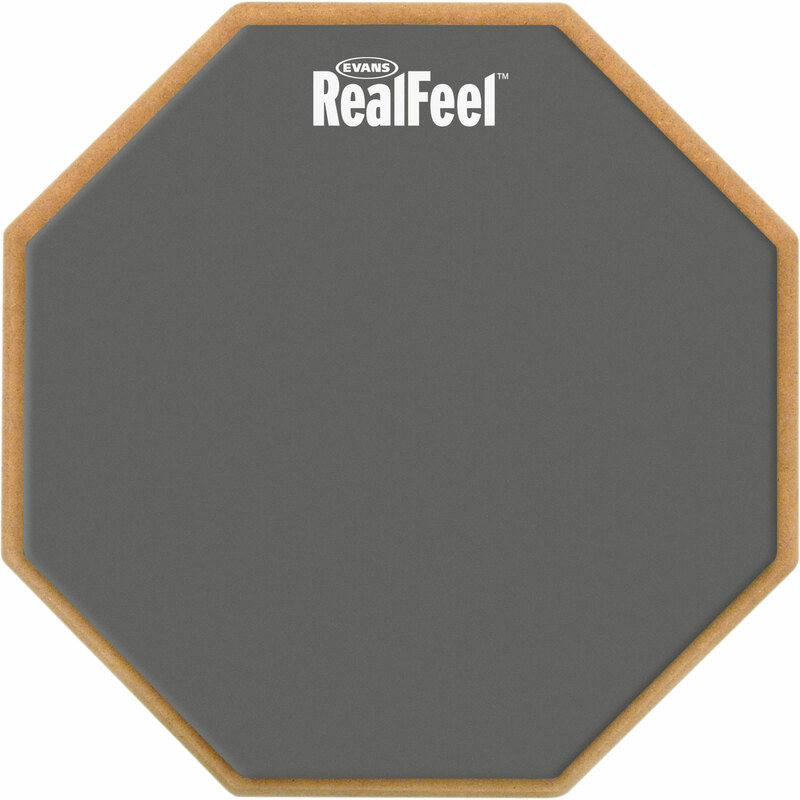 The RealFeel series has been constantly improved upon over the course of decades with changes like covering the rubber pads with fabric to prevent scuff marks, to formulating new rubber densities for better feel and response. Users have near-universal praise for the RF-12D. The convenience of having two surfaces with different responses to practice on is a consistent positive comment on the product. The noise level is noted to be quiet enough not to be distracting to people in their immediate surroundings. Two customers have noted that some of the pads they received have quality control issues with regards to air pockets/uneven gluing of the pad. This resulted in an uneven feel when their sticks hit the unglued parts. Other people noted that there was a strong industrial smell on their drum pads. There were comments on the wood material being compressed MDF and not an actual piece of cut and shaped hardwood. The Evans RF-12D is a perennial favorite in the drum community for years. Two different surfaces allow you to target different areas of your playing. One side has less bounce and gives your hands a better workout. This alone can do wonders for your stamina as a drummer. The other side has more bounce and allows you to work on your accuracy and speed. The Vic Firth Double Sided 12” Drum Practice Pad has two surfaces with differing density and rebound. The gray side is more silent and offers a lot of rebound and is reminiscent of a high tuned rock snare while the black side has a noticeable "clack" and gives the feel of a tight kevlar marching snare. Mistakes are more evident when practicing with the black side due to the sound which makes it great for perfecting the timing of your flams. The bigger 12" size makes it more comfortable for use on your lap compared to a 6" pad which may tilt or fall off your leg. Many note that the size and construction of the drum pad makes it convenient to use on a snare stand, desk or their lap. The pad itself feels solid and stable according to several reviews. Some note that the volume of both sides helps them perceive hit accuracy better than completely silent pads. A user liked the bouncy and lively response. While some see it as a plus, having a noisy drum pad was also seen as a negative for other drummers as they preferred to practice in silence. They would not recommend the Vic Firth Double Sided 12" Drum Practice Pad for people looking for the least amount of noise. Others note the bounce to be excessive particularly when using heavier sticks. This may be a detriment for people looking to work on their stamina. The Vic Firth Double Sided 12" Drum Practice Pad is a great option for those accustomed to tightly tuned shells due to the response. The volume level of the black side will either be a positive or negative point depending on whether you want more note perception or silence. 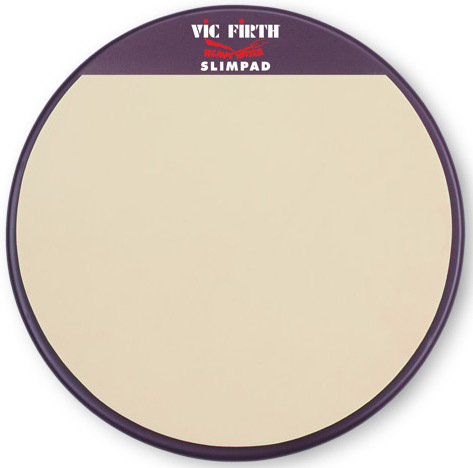 The Vic Firth Slim Pad has a thinner playing area than most drum pads. The gum rubber pad is only around 1/8" thick and is meant to mimic the feel of a high tension marching snare drum. Couple that with a thick wooden base and a non-slip rear mat and you have a solid foundation to train on. Most users note that this particular pad feels the closest to a marching snare that they've ever felt. This is a definite plus if you're also a rock drummer that enjoys high tuned snares. The response was noted as snappy and making speed playing and rudiment practice an enjoyable experience by several users. One drummer noted their skill translates well into an actual snare drum. Because of the thinner rubber used on the playing surface, the Slim Pad can get loud. Several users have noted that it is among their loudest pads which may be a problem if your goal is silent practice. Another user mentioned that if you're more used to lower tuned snares, the response may be too much. If you're willing to trade off volume with a fairly accurate response compared to a high tuned marching snare, the Vic Firth Slim Pad is a great training tool. Different to most other drum pads, the Offworld Percussion Invader V3 utilizes a proprietary material they call Darkmatter which was formulated to bring the playing feel close to a kevlar drum head. The Pad itself features a raised rim area made of plastic. This allows you to incorporate rimshots into your practice. At 13.5", the pad itself can fit over a 14" snare easily. Because of the proprietary playing surface material, many users note that transitioning from pad to snare feels natural and avoids "Pad Hand". Several reviews praise the articulation of the playing surface, taking note of how different the pad sounds depending on where it is struck and it enables them to incorporate more expressive runs into their practice routine aside from center hits. Several reviews note that the bottom surface loses traction when dirty and may need several wipe downs with a damp cloth for it to regain grip on surfaces. Others note that having an articulate and moderately loud pad defeats the purpose of having one in the first place. Some feel that the Invader V3 is too expensive for a practice pad. For those who want a practice pad that allows creative practice with multiple articulations, the Invader V3 is the ideal drum pad. If volume level, size and price are not a cause of concern for you, the Invader V3 is a great choice. 82 out of 100. Incorporating 250+ ratings and reviews. For those who feel that practicing on just one pad isn't enough, The DW Go Anywhere is a 5 piece silent drum practice solution emulating the placements of an actual drum kit including the kick drum. With a wide adjustment range, you can closely match your preferred kit placement all while occupying just a little over the size of a typical cymbal stand and large ride. Pads: Two 8" pads for tom and cymbal, two 10" pads for snare and floor tom, one bass drum pad. People who purchased the DW Go Anywhere Practice Set generally note that they bought it for it's compact size and convenience. They mostly note that it enables them to silently practice their accuracy when moving across different parts of the kit. The kick pad being a bit loud is a common caveat from owners but still significantly quieter than an actual kick drum. Screws coming loose from hard hits are also noted as a minor inconvenience. Some users would rather spend a little more money on a cheap electronic drum set. The DW Go Anywhere 5-Piece Practice Set presents the perfect solution for apartment dwellers or anyone who wants a compact practice solution while not necessarily needing to hear actual drum sounds. 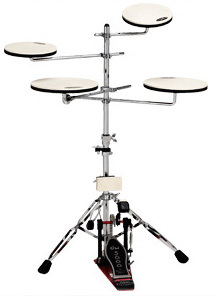 It also makes a great teaching tool for drum teachers. A lot of companies say that their drum pads feel just like an acoustic drum, offering the same response and feel. Supposedly, this allows you to practice silently on what is essentially a drum head you can put on any surface. Unfortunately, in practice it doesn’t always work out this way. There’s almost always going to be a difference in how a practice pad feels compared to a real drum head, and there’s also going to be some variance in how one practice pad feels compared to another. Essentially, practice pads generally fall somewhere between two extremes. They either feel “dead” (like you’re hitting a pillow), or “bouncy”. One isn’t necessarily better than the other, and many companies offer double sided practice pads that give you the best of both worlds. Though practice pads are intended for silent practicing, some offer anything but. Sure, they’re definitely quieter than a full drum kit, but they can still be loud enough to be disturbing to the people around you. The main factors that are going to decide the volume of a practice pad is the density of the material used, how much give it has, and the inherent acoustic properties of its construction. So, for example, the Vic Firth Double Sided 12” Drum Practice Pad is going to have two different base volumes. The softer side is going to be quieter because it has more give, while the firmer size is going to give you more of that “clicky” practice pad sound. If you get a drum practice pad that you feel is too loud, some have suggested putting a shirt, handkerchief or any similar material over the surface but do take note this may change the response slightly. Practice pads come in different shapes and sizes. Smaller pads are more portable and can help you work on accuracy, but larger pads measuring closer to actual snare dimensions such as a 12" pad can more accurately replicate the feel of an acoustic drum. As a general rule, choose a drum pad size based on what you want to target when you practice. If you’re looking for a silent practice session that is easily transferable to your kit, look into a 12” practice pad. Likewise, if you’re going to be focusing more on accuracy a 6” pad may be more up your alley. An 8” or 10” provide a happy medium between the two extremes. There are a plethora of different practice pads available in different materials and sizes, so as long as you know what you’re looking for you can find a combination of these two factors that will allow your pad to best work toward your goals. A term you’re going to hear a lot when you’re looking for a practice pad is “pad hand”. Pad hand is when your hands grow accustomed to playing on a drum pad, resulting in a loss of fidelity and power on an actual drum kit or marching snare. Some drum pads claim to alleviate this issue with their playing surfaces. You may find that the drum pad you eventually buy will feel different from your actual kit. Do take note of what feel the pads have on our list so they can accurately replicate your snare or drum kit. Higher tunings and marching snares usually have their equivalents as pads with a bouncier feel while low tuned rock snares are closely analogous to pads with less bounce. For this March 2019 update we began by looking at single practice pads and practice pad sets available from major online American music equipment retailers and short-listed 16 singles and 3 sets for closer analysis. Then we collected over 3,100 rating sources which were then processed by the Gearank Algorithm to produce scores out of 100 for each product. This process enables us to choose top rated equipment based on user reviews, forum discussions and expert opinions. For more information about this process see How Gearank Works. Submitted by Jason Horton on Oct. 3, 2018. 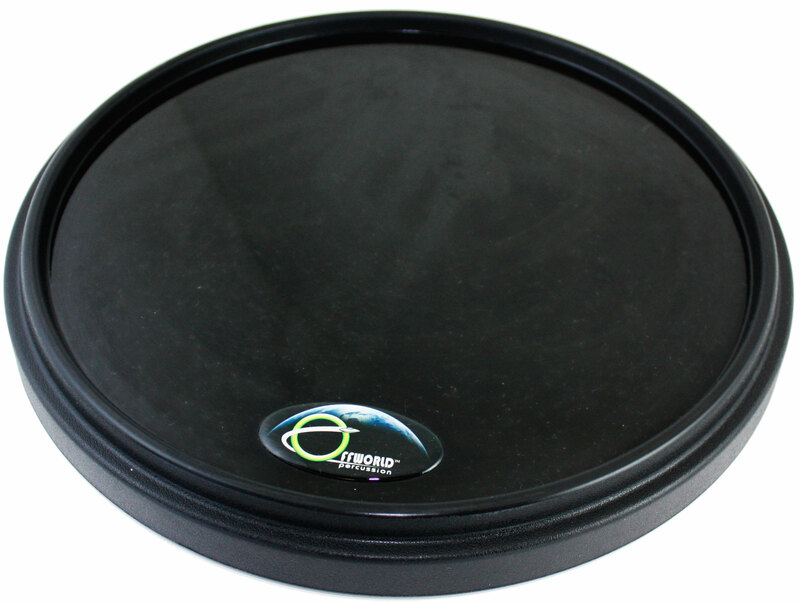 The following practice pad has been removed from our recommended list above due to a lack of availability: Tosnail 12" Silent Drum Practice Pad. Submitted by geoff nicholson (not verified) on Dec. 20, 2018. The Evans RF-12D RealFeel works well for me. Very consistent bounce for double strokes and it can take a fair bit of punishment. Submitted by Jason Horton on Mar. 7, 2019.